The footage below are two experiments in which we turned the camera 90 and 180 degrees respectively. Both exhibit properties that are distinct; it’s really strange that a slight change in the camera’s angle alters the way the virtual space is perceived. 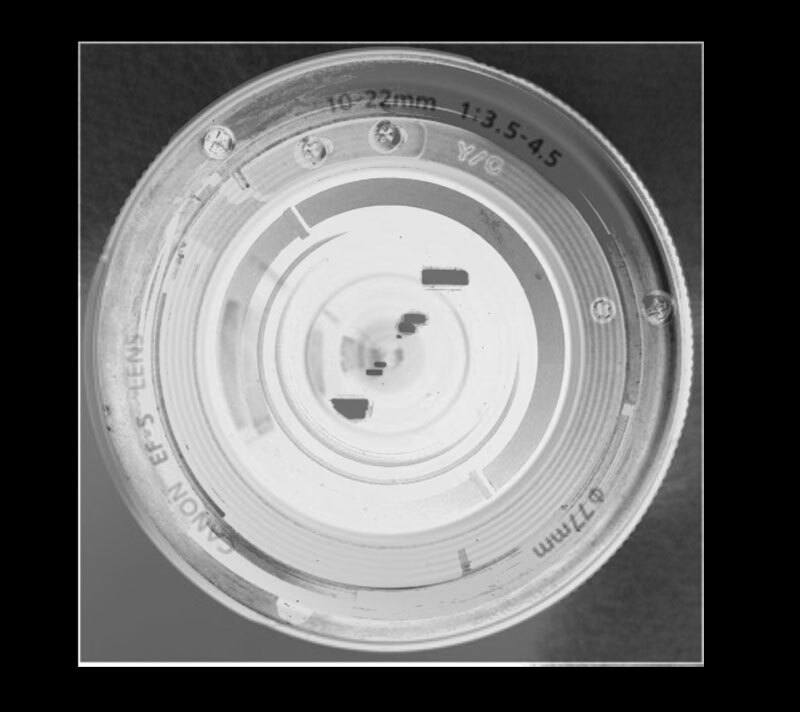 The delay is even more distinct, images spiral into the center. When many elements enter the frame, the escher-like dimension creates a multitude that has a particular synchronicity. The feedback loop, because of its repetition and the slight delay with each layer, is sort of akin to a rhythmic dispersal of events over time, and the virtual space created by the frames completes the illusion, forming a “well” or a “tunnel”. I think the frames do have a powerful effect; when they are seen (and repeated into the video loop), they evoke a “cavern”, the visual form that philosophy and psychology often evoke when describing consciousness. 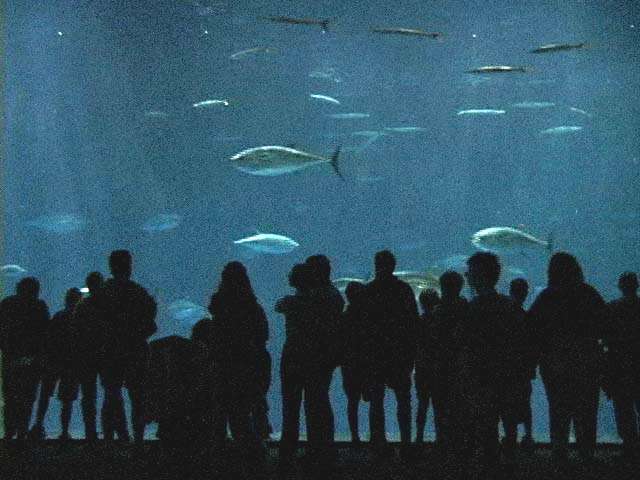 Perception does play in how the individual conceives the world; the video feedback loop hints at this intersection of perception and conception, but it needs to be studied more if ever we decide to focus on evoking this space. 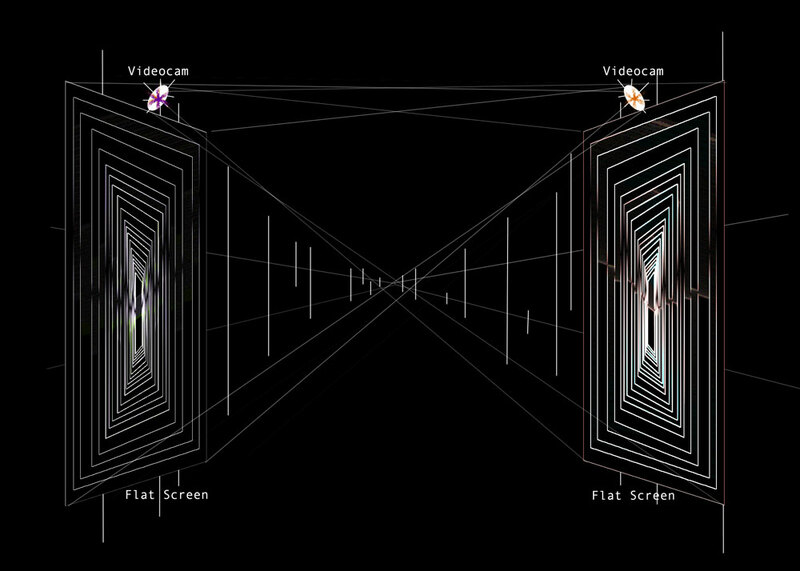 In the video above, the camera is on its head, and the virtual space changes. The multiplicity of the reflections become more pronounced, and the alternation of the up & down orientation makes it tricky to follow the image as it replicates into the tunnel. I think it is the effect of the reversal of even the direction of the movement. In the second part of the video, we experimented with turning the camera, and it produced a fanciful symmetry- but it just looked ordinary and predictable, since it echoed familiar forms. The shape of the symmetrical convolution became the focus, rather than the repeating reflections. Near the end of the video, the camera zooms in, and the “corridor” melts into this amorphous image; and when the fingers enter the frame, the reflections also melt and dissolve. The fingers’ quick movement leaves this recurring flash, and when the camera zooms out, the flash is seen disappearing from frame to frame, into the tunnel. This flash is what I found particularly interesting in these sets of experiments; it’s as if the movement is caught, and its reflections in the loop allow the viewer to see this ephemeral event captured, then slowly disappear. My collaborative project with Katrin churned out a strange creature, this video feedback loop that harks back to the funky video experiments of the 60’s by Nam June Paik and the other pioneers of Video Art. We spent quite a while jamming our thoughts together and just throwing ideas on the table. The best thing about it was when our thoughts started to have its own thoughts, mutating into its own monster (haha- please read Hofstader’s I am a Strange Loop). Both of our research led to this realization that the collaboration must be a tangible thing, a digital thing; quite fun to finally hit the concept and ruminate on the possibilities over endless cups of coffee and thick puffs of tobacco. I’ve been reading about Peter Campus and Ernie Gehr, experimental filmmakers who are still making provocative moving images. Even after their groundbreaking work in the 60’s and 70’s, they still developed their work, and they still challenge and reveal new things with their sheer ingenuity and imagination. What struck me was how they went the opposite way; most filmmakers went straight to the narrative and pursued the thematic evolution of their visions, but Gehr, Campus and a few other filmmakers walked the long trapeze line between the act of perception and the moving image. The thing that gives me hope is that their recent work is imbued by their personal visions. They still investigate the mystery of meaning-making and are never afraid to come to their own conclusions on what the act of seeing means. The analogous statement above basically reorients the understanding of the moving image as a constitution of movement, rather than an illusion of movement. Deleuze also concludes that the moving image in this context becomes a reality , rather than a representation of it. This follows the theories of Manovich surrounding the nature of the moving image in New Media; the Macluhan ‘medium is the message’ dimension kicked up to the level of the waking dream. So how do we see the world now? More importantly, how do we see ourselves? Yes, it is increasing difficult to create something in this era of the screen, especially if you are fueled by all of this philosophical polemic. But again, knowing how powerful the moving image is (proof? Just look around at how many things you buy and believe because of things you see on screen), artists do bear a responsibility. This ethical stance actually bears more possibilities for innovation, because I feel that the other paths are slippery and well-exploited already by TV and the advertising industry. 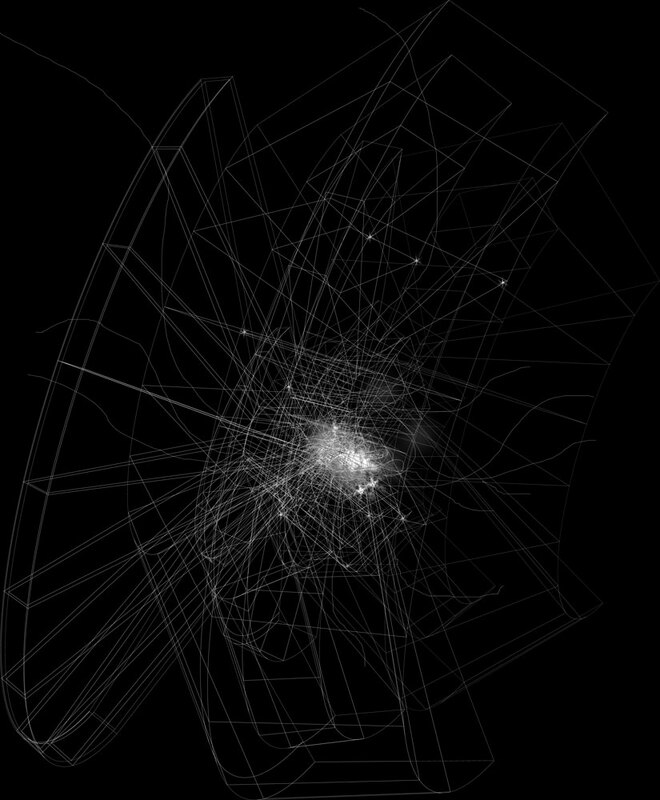 Why make moving images that merely re-imagine the technical capabilities of the machine? Why not turn the technology on itself, transform its function, re-imagine how it makes images? The moving image and its many incarnations present many issues regarding its production, consumption, perception and ultimately significance as a cultural artifact. In a Baudrillard age, where moving images shift seamlessly through different channels of media, one can argue that the territory has shifted as well; these simulations play and exploit the very nature of perception, the locus of meaning-making for the moving image. This paper will focus on the art practices of the cinematic avant-garde who still question and challenge these issues. I place my practice within this context, and with the examination of the works of Ernie Gehr and Peter Campus, the intentions and processes evident in my practice will bear a shared philosophy (or strategy, or even both) with the aforementioned artists. Lev Manovich in his essay Abstraction and Complexity describes the nature of the current manifestations of the moving images as simulations; the power of the computer’s processes to reproduce not only the nature, but also the techniques. The cumulative result of all these developments – 3D computer graphics, compositing, simulation of all media properties and interfaces in software – is that the images which surround us today are usually very beautiful and often very stylelized(sic). The perfect image is no longer something which is expected in particular areas of consumer culture – instead it is an entry requirement… the mixing of different representational styles which until a few decades ago was only found in modern art (think of Moholy-Nagy photograms or Rauschenberg’s prints from 1960) has become a norm in all areas of visual culture. As outlined and discussed by Lev Manovich in The Language of New Media, the very medium that I use to make moving images has come about in an interesting way. Unlike the other traditions of art where the medium evolved from artisanal and craft-based practices, the technologies I create with come from the rapid industrial developments of the 20th Century. From the acquisition of footage to the composition of media elements, the nature of the machine is ever-present. Inherent to the computer are both the artistic possibility and problematic nature of its power. Through its capability to simulate all old media and even remix its techniques, this power cannot be ignored as merely an aspect of a digital art practice; rather, in my practice, it is its consequences that I confront. 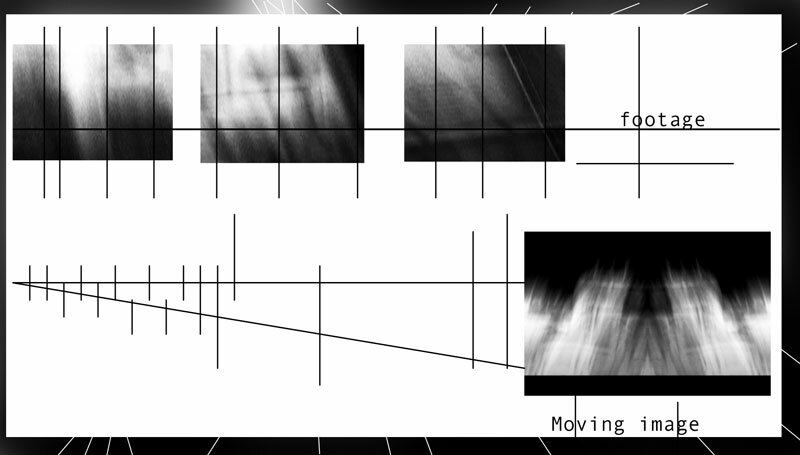 The seminal work Serene Velocity (pictured above) by Ernie Gehr is a critique of the apparatus of cinema and spectatorship, the center of the problematics of the moving image. The film at the start may seem just a play on the dynamics of perception, but as it progresses, the moving image reveals a different, even subversive nature. Instead of using the representational power of film, he focused on a singular image and pulsed it by rhythmically by moving the focus plane of the lens. But the film is not in the least static. The work’s minimalist aesthetic is not only to serve the construction of an image, but a meditation on the act of perception itself. 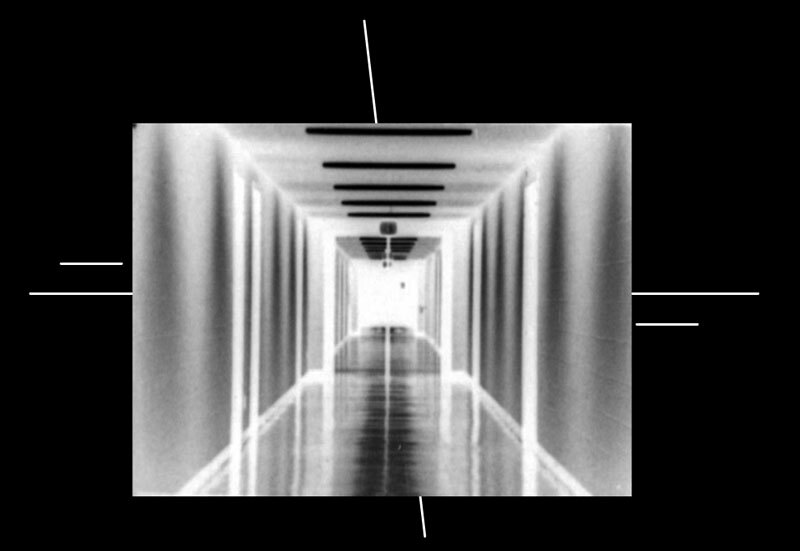 As described by Gehr, the moving image can be something of its own, and in the case of Serene Velocity, the image becomes the gaze itself; the corridor becomes the shape of the gaze, the moving image an active work of confrontation. Unlike Ernie Gehr, Peter Campus’ work started with video. He was one of the pioneers of video art, exploring the unique properties of the medium (such as the double-channel, chroma-keying image above). His focus though was the self, a rigorous and diverse set of approaches to the concept of self expressed in the moving image. In the video Three Transitions (frame grab above) and other works made in the 1970’s, he explores different acts of self-cognition (Laguiera.2006). For example in the installation Interface (1972) he turned the camera on the viewer, providing instances where one would see the self as both reflection (on a glass) and moving image (video projection). Perception is one of the routes explored in trying to answer this question, which philosophers and psychologists ponder continually, among others. Certain artists have also explored it by developing a dimension often deliberately dismissed by cognitive science theoreticians, which is none other than lived experience. Such experience is understood here as a unitary perception, a human experience that does not validate, even on a purely theoretical level, the duality of body and mind. Such a position has been criticized by a number of authors, such as proponents of psychophysical identity (the identity between mental states and neuronal states), eliminativism (psychological experience is eliminated for the benefit of a neurological explanation), or cognitivism (which notably separates cognition and consciousness). As Laguiera explains in the quote above, this duality, and this conceptual separation of the body from the mind, can be critically examined by the act of perception. 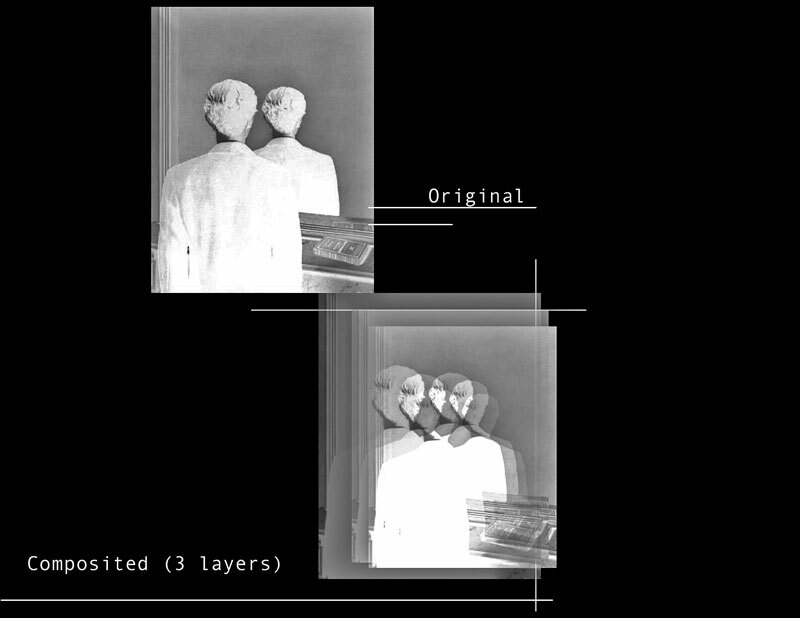 This paradoxical approach, shared by Ernie Gehr, reveals not only the qualities of the medium of the moving image, but also an insight into the postmodern condition. Manovich’s theories on simulation already illuminate its consequences: the image without meaning, the gaze bereft of understanding, the making of art without meaning-making. So where are the possibilities? The avant-garde filmmakers of the 60’s and 70’s were working mostly on 8mm and 16mm. Stan Brakhage, Ernie Gehr, The London Film Co-operative and numerous other experimental filmmakers were making films that sought to criticise, examine and deconstruct filmmaking itself. In the various historical and critical books and essays on these practices, the films were diverse; the sexual polemic of Andy Warhol, the materialist/structuralist experiments of the London Film Co-op, and even the Lacanian leaning of the Surrealists found itself in the films of Malcolm LeGrice (Hamlyn.2003). What united the avant-garde was its mode of creation. This independence is marked by a critical approach to the status quo, and thus creates a space to innovate outside the concerns of mainstream culture (Rees.1999). This historical antecedent is actually quite similar to the emergence of video art, whereas the introduction of inexpensive technology created opportunities for artists like Nam Jun Paik, Peter Campus and Bill Viola to investigate issues outside the concerns of the status quo. In this diversity of intentions, philosophies and agendas (political, artistic, etc) where can an avant-garde practice locate its engagement? Lev Manovich’s interesting theory is that new media’s precursor is film, and therefore the promise of film to be the Gesamtkunstwerk of all the arts can be found in even greater potentiality in New Media (Manovich.2001). But upon examining the precursor, Vertov’s Man with a Movie Camera, it is the language of the machine that dominates, the endless transformations and permutations of the image, very much like a formula multiplying its algorithms so that it gains value, but not meaning. Perhaps one can argue that the kino-eye is much like the apparatus of cinema, endlessly replicating representations of reality. 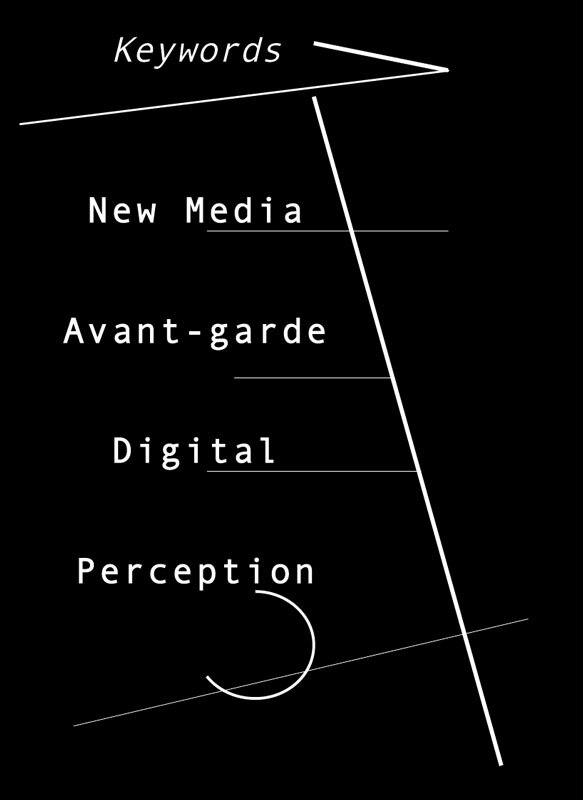 New Media’s simulative capabilities, with its hybrids of representation and technique, will not offer any restitution or even an avenue for critical engagement in New Media. Within my practice, I have chosen to locate my critical concerns in the space of perception. In Luis Bunuel’s Andalusian Dog, (image part of composite above) the eye is sliced open, inter-cut with the moon being obscured. This piece of surrealism is instructive in the sense that it is the literal cutting the eye open that becomes the act of engagement; to release the pre-conceived notions of the moving image, one has to slice into the process of perception itself. 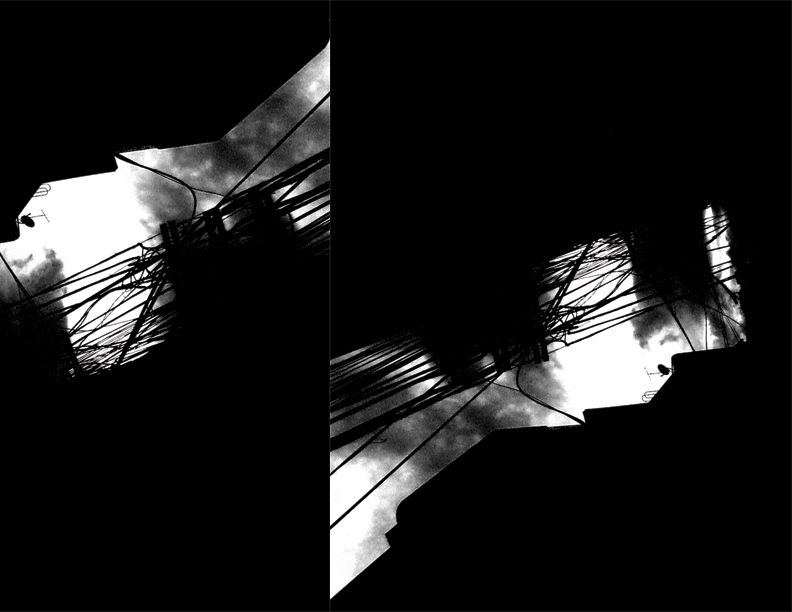 The simulations offered by New Media in a digital art practice must be viewed critically, and even confronted by revealing the nature of the image itself. In this context, the collaboration work with Katrin Maria Escay evolved, reflecting the research we have done. The current setup will now include video cameras placed atop each screen and captures the images from the other screen, creating a video feedback loop. The rationale behind using feedback loops instead of self-generated imagery as the main aspect of our work stem from our discussions about the things we’ve found on our individual research. Katrin’s focus is on the experiential quality of the work, while I wanted to incorporate the dimensions of the gaze, of perception. The resulting image on each screen will be dependent on the presence of a viewer. Because of the video feedback loop, a seemingly endless corridor will be seen by the viewer, with the image of his/her back, similar to Magritte’s Reproduction Prohibited (1937). There will be infrared sensors mounted on each screen, providing the possibility of adding subtle details (through real time compositing and video feed manipulation- Puredata) to the virtual corridor and the image of viewer when gazed at for a certain amount of time. The collaborative piece will be at times opaque, and at times ambiguous- these parameters will be triggered by the variation of viewer interactions. The two monitors will also have distinct characteristics in terms of the digital reflections- the project is open to the mixing of elements from the two screens, and also techniques of video feed manipulation. The proposed interactive work will turn the gaze of the viewer upon itself, like the experiments of Gehr and the installations of Campus, and yet also reflect a negated image of viewer, which can change over time. The corridors also simulate a sense of space, where meaning-making can be triggered by certain elements. But we will let the investigation and the experiment determine if there will be elements at all- it might be just the slight manipulations of the reflection that will form the more interesting parameters of the interaction. Brown, L. and Strega, S. eds. (2005), Research as Resistance: Critical, Indigenous, and Anti-oppressive Approaches, Toronto: Canadian Scholars’ Press.